A few weeks ago, my son turned 17! I always, and I mean always, bake him a cake! Of course chocolate is in his request every year, so this year I decided on Peanut Butter and Chocolate! The best of both worlds, how can you go wrong with this? Whoever invented those chocolaty peanut buttery creamy cups we know as Reese’s, was/is a total genius! This cake, however, does not have any of those candy cups in it, nope, not one…..
First we need to discuss the peanut butter…..do not surrender to the jarred stuff in the bread aisle of the grocery store. It’s loaded with preservatives and way too much sugar! Instead, pay the few extra bucks and go to the peanut grinder usually found in the organic aisle, and make your own peanut butter. It’s so much tastier, healthier, and better for your body :) I guarantee, if you use the “jarred, fake” peanut butter in this recipe, it will taste overly sweet! 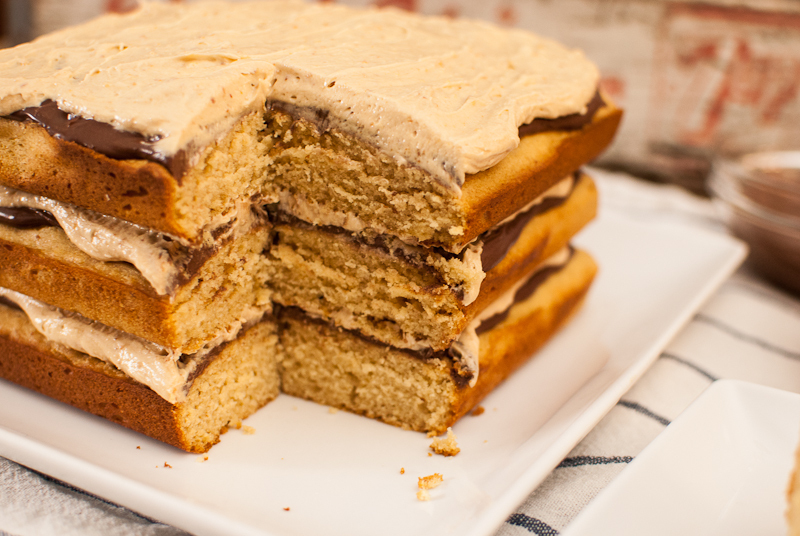 The cake, it is a peanut butter cake, not a boring white cake. 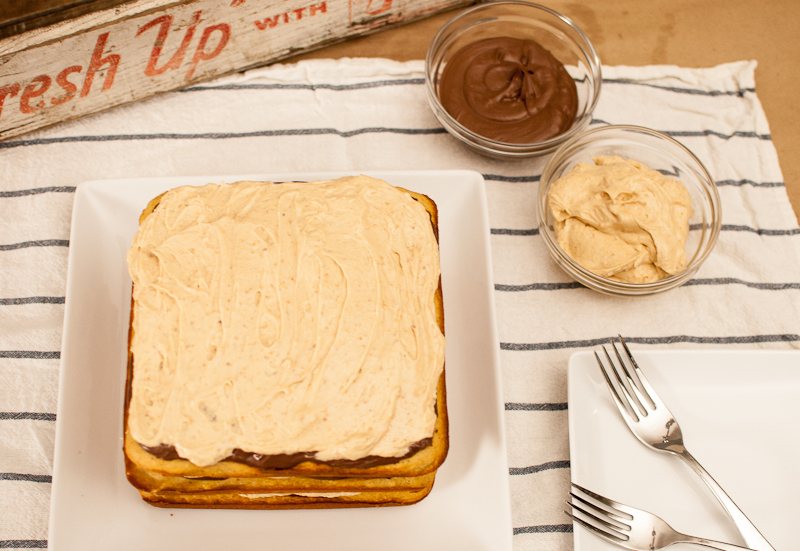 Hey, if you’re gonna go all out with PB and Chocolate, well do it right! No boxed mixes either. It doesn’t take very long to whip up a cake from scratch. It also tastes better then the box stuff. You can use round cake pans too, but I decided on the square ones. Gives the cake a casual, kicked back look. I will admit, I’m not a fancy cake decorator either, I like the rustic, just thrown together look. Butter….lots of butter baby! To make a great butter cream frosting, lots of butter!…(This is not the time to be thinking about that diet you were on a few days ago)…a great butter cream frosting is sifted powdered sugar whipped with butter. 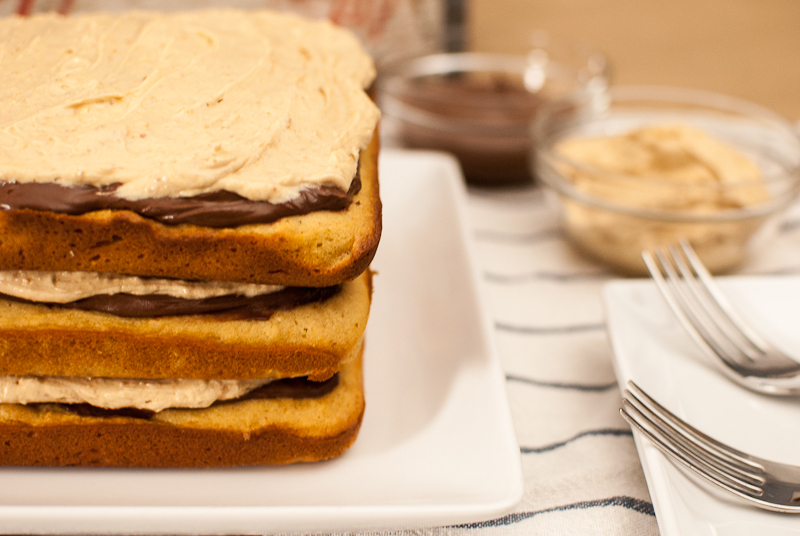 Light, fluffy and creamy, and yes- more peanut butter! And we can’t forget about the Chocolate! A chocolate ganache is a rich, thick, chocolate layer…. a must in this cake. Heated whipping cream to melt the chocolate is what it’s all about. You don’t want to mix the chocolate right away though, let it sit and melt on it’s own in the pot of cream, then come back to it and whisk it all together, creaminess magic happens! My son, hard to believe he is 17 now, loved this cake! He says it tastes just like a Reese’s peanut butter cup, in fact he asked if there were any in here! Prepare cake pans, butter and flour bottom and sides. I also like to add trimmed parchment paper to the bottom of my pans, The cakes come out very easy with this. Sift together the flour, baking powder, and salt in a bowl. Then whisk together to make sure they are all combined. In a mixer or large mixing bowl, cream together the brown sugar, and butter together. While mixer is on low, slowly drizzle the oil and vanilla in.Beat on medium until fluffy, scraping down sides of the bowl as you go. Blend in the peanut butter on low speed, then add eggs one at a time, mixing well in between additions. With the mixer on low, add flour mix and milk alternating flour and milk additions until all is added and mixed well. Do not over mix batter, add the last addition of flour by hand with a spatula. Divide batter among 3 prepared cake pans, 3 8x2 round pans or 3 8x2 square pans. Bake for about 28-32 minutes, until cakes are golden and firm. Let cool on wire racks for 30 minutes before removing from pans. Heat the cream over medium in a saucepan. Do not let the cream boil, it will burn. As soon as small bubbles appear, remove from heat and add chocolate. Do not stir. Let stand for 10 minutes allowing the chocolate to slowly melt on it's own. Now whisk together until creamy. Let cool at room temperature before using on cake. Makes about 1 1/2 cups of ganache. 6 Tbsp of unsalted butter at room temperature cut into small cubes. In a large mixing bowl with paddle attachment on the mixer, beat the butter and peanut butter until smooth. Add the powdered sugar, cream, and vanilla and continue mixing on medium until light and fluffy. Frosting will keep for 3 days at room temperature. 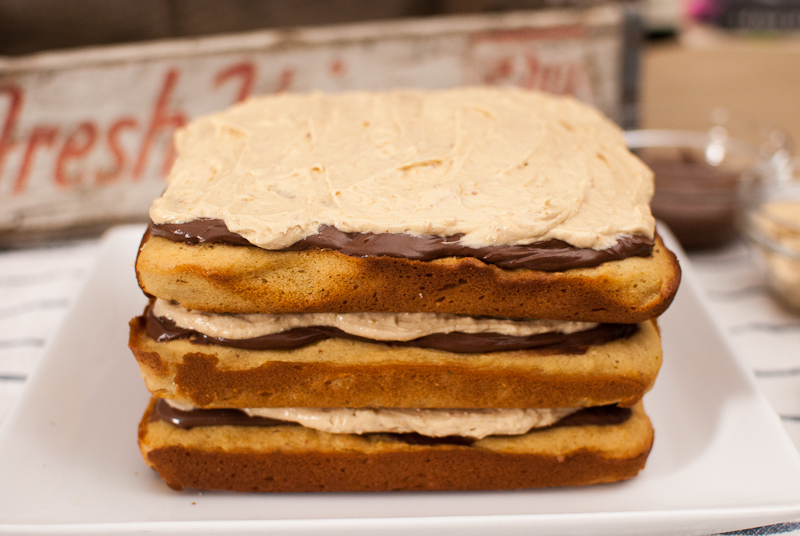 To assemble the cake, smooth one layer of ganache on top and let cool before adding PB butter cream, then repeat layers until are layers are stacked. Cake will keep for 3 days at room temperature. 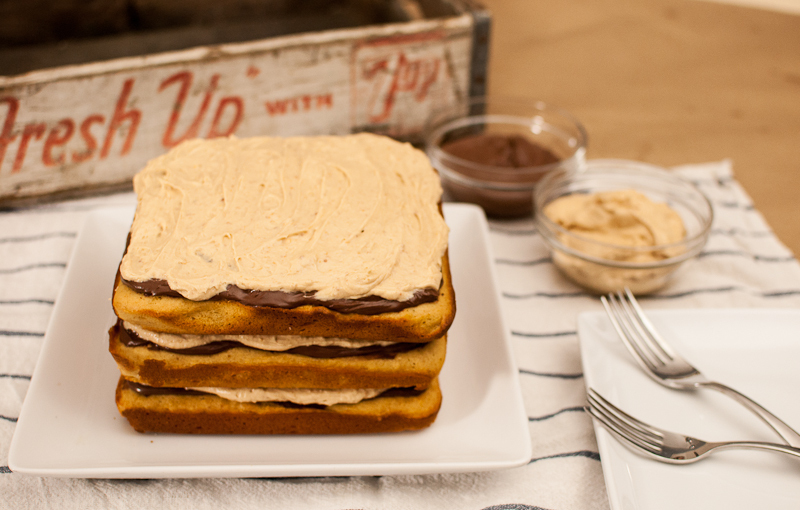 Note this cake is not frosted on the sides, it’s a rich cake already, but if you want to frost the sides, then double the recipe for PB butter cream. This cake is like all of my very favorite things! YUM! !